LOOK at your filter. You may see two sizes. A nominal size (ex: 20x20x1) and an actual size (ex: 19-1/2 x 19-1/2 x 3/4). This is the standard in air filter manufacturing. Nominal size refers to the size of the filter slot. So, a 20x20x1 filter is made for a 20x20x1 slot. Actual size is smaller to allow easy installation/removal of the filter. 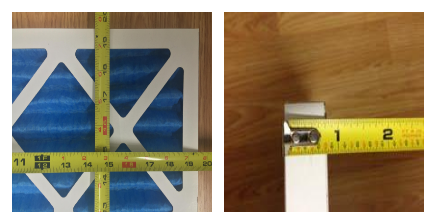 MEASURE your filter to confirm that the printed size is accurate. This ensures that you have a filter that has not been altered from its original size. MEASURE the filter slot to determine the available space for your filter. Choose your filter based on the size of the slot. Ex: if your filter slot measures 20x25x1 as shown in the images below, you would choose a 20x25x1 filter. NOTE: If you cannot find a stock size that will fit the opening, you will need a custom filter size. Tips for selecting custom air filter sizes are below. For wall or ceiling vents: See instructions below under Tips For Choosing The Right Custom Air Filter Size to determine the correct size. This does not mean that you need to order a custom size for these openings, but you will be able to see helpful information about ensuring a proper fit. These vents typically need more attention regarding exact filter size as compared to standard filter openings. For Whole House Air Filters: These are larger filters that are usually 3-6 inches thick and are installed in a cabinet-type housing with a door. You can search our site by brand name, size, or model #. Brands are listed in a pre-filled drop-down menu on the homepage. You can search by size or model # in the upper right hand search box. Brand, size, and/or model #s are usually located on the filter or the door to the filter housing. CHOOSE your replacement air filter type and size using the size menus on the Custom Air Filters page. If you have a custom filter that fits properly, you can simply choose the exact measured dimensions of your filter. NOTE: You should measure your custom filter even if the size is on the filter. Some manufacturers allow a tolerance of up to 1/4-in. under. We will make the exact size you request. Wall or ceiling vents WITHOUT clips or brackets to secure the air filter in place – A close fit is recommended to prevent free movement, fluttering, knocking, or whistling sounds that may come from an air filter that fits too loosely. Your custom size should be 1/8-in. smaller than the opening. Wall or ceiling vents WITH clips or brackets to secure the air filter in place – You can still select a filter size that is 1/8-in. smaller than the opening, but it is okay to go up to 1/2-in. under. Standard filter slot usually located by the unit – You have the most flexibility in choosing an exact size here. While you can choose a size that is up to 5/8-in. smaller than the opening, we recommend that you choose a size that is 1/4-in. under the size of the opening. If you are still unsure about what replacement air filter size to order, please contact us or call us for assistance and we can help you!